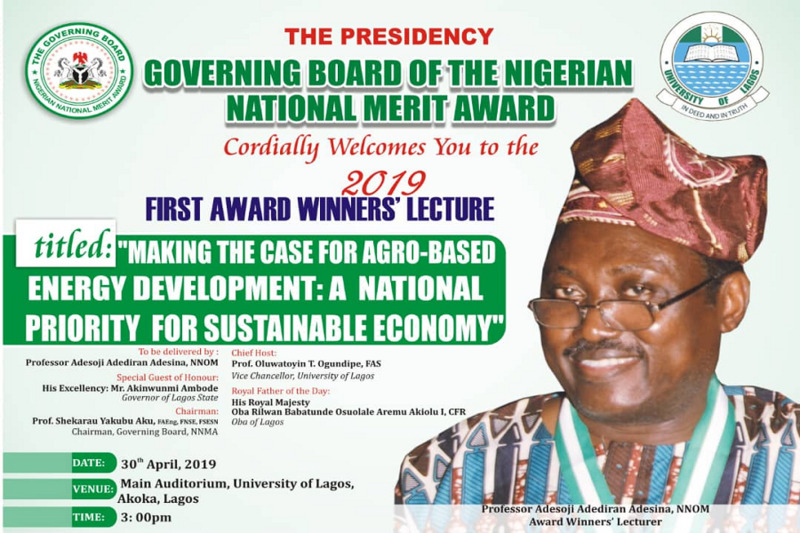 The Governing Board of the Nigerian National Merit Award is currently soliciting nominations or applications for the award of the Nigerian National Order of Merit (NNOM) for the 2019 round. The deadline for nomination is NOW EXTENDED TO 25TH APRIL, 2019. Nominations are valid only for the year of nomination. However, candidates who have been previously nominated should state clearly additional work(s) done since they were last nominated or the new grounds for re-consideration of their nomination. NNMA is a value driven agency of the Federal Republic of Nigeria. It was established by Act 53 of 1979 as amended by Act 96 of 1992 (CAP 122 LFN, 2004). The Mission statement for NNMA reads: “Committed to stimulating and rewarding, academic and professional excellence for national development of Nigeria”. The Nigerian National Order of Merit (NNOM) is an “Order of Dignity” and distinct from the National Honours. It was instituted to accord proper and due recognition for outstanding intellectual and academic attainments and contributions to the general development of Nigeria. The President of the Federal Republic of Nigeria is required by law (NNMA Act Section 8) to confer the NNOM Award annually, on the recipient(s), on the first Thursday in the month of December. The objective of the Award is to stimulate and reward excellence in Science, Engineering/Technology, Medicine, Humanities, Arts & Culture and other fields of human endeavor. The Award is open to all citizens of Nigeria at home and abroad. Any Nigerian citizen of outstanding merit can be nominated by one or more Nigerian citizens. Any person may by himself/herself, where not sponsored by another person, apply to the Board for this purpose. Where two or more Nigerians are collaborating on any deserving undertaking, they can be similarly nominated for a joint Award. Nominations shall be made strictly on the prescribed Nomination/Application Form, and in the format therein. Sponsors should provide brief information on themselves. The Nomination/Application Form may either be collected at the NNMA secretariat or downloaded from the NNMA website, nnma.gov.ng. The form as advertised is also valid. A list of not more than ten publications cited in the candidate’s curriculum vitae which in the nominee’s consideration, buttresses his/her claim to uniqueness and merit. Copies of the ten publications must be submitted with the application. 3 portrait photographs of the candidate. All nominations and supporting documents, including copies of the ten publications submitted to buttress the nominee’s claim to uniqueness and merit, must reach the Secretary of the Nigerian National Merit Award on or before the stipulated dead-line. Any nomination or application including the specified requirements arriving later than the dead-line will not be considered. Selection will be made from the wide range of contemporary works which are innovative, creative, essentially Nigerian in content and of national and international distinction; such works should emphasize the uniqueness of the achievements to humanity generally and Nigerian society in particular. Humanities, Arts and Culture and other fields of human endeavour. When and where necessary, External Assessors are usually engaged from the national or international academic community. Successful candidates will be notified about the outcomes of the process between October and November 2019, to be followed by an official public announcement latest two weeks from the date of Investiture. The Investiture holds back-to-back with the Annual Forum of Laureates of the Nigerian National Order of Merit. A statement, preferably by the candidate, of between 250 – 500 words, specifying/defining and clearly illustrating in concrete terms, NOT generalities, what the candidate considers his/her unique and meritorious contribution to knowledge in his/her field of endeavor/specialization to merit consideration for the NNOM award. List below the statement not more than ten publications cited in the candidate’s curriculum vitae, which he/she considers to buttress his/her claim to uniqueness and merit. 9. Candidates who have been previously nominated should state new grounds or additional works done since last nomination.